Made this together with the softball cake for Judy's birthday last month. I got the 8 ply red wool thread from Spotlight. 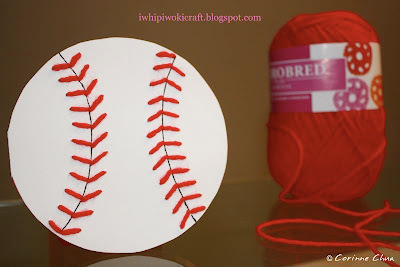 After googling for a picture of softball / baseball, I embarked on this mini project with no idea on how it will turn out. I drew the 2 lines and started to stitch the red sewing on the softball, stitch by stitch, hoping that it will turn out fine.